Propelrr, a Digital Marketing Agency in the Philippines. Search Opt Media, an SEO Company based in the Philippines. It is an achievement for Propelrr to bring all its regular employees to Bangkok, Thailand. It was quite an experience because we did not limit ourselves to the usual itinerary, meaning, it was a combination of planned tour and spontaneous trip. From train to Tuk Tuk (motor taxi), to rented van and river boats, even elephant ride. We’ve tried (as much as we can) varieties of Thai food, be it street food, mall food or buffet on a cruise. And oh, shopping! We stayed at Bangkok Christian Guest House. The rooms are spacious and clean. It is also close to train station, mall and night market. In three days and three nights, we were able to do shopping at Chatuchak Market, Patpong Night market and Siam paragon, see Jim Thompson Museum, ride river boat to Grand Palace, experience a luxurious River Cruise, and Ayutthaya Day tour. Fun-and-activity-filled, but yes, still a lot of reasons to go back. More importantly, we were able to forget about work and enjoy each other’s company. We hope to see more faces with us next time. Lately I’ve been feeling a little lost. I know what I’m doing but I don’t know where I’m heading at. I wanted to give more and do more but it seems that circumstances are dragging me to a different direction. A direction I am not familiar, more so confident, with. I am pushing myself to be happy, convincing myself that I should be enjoying every single day. Don’t get me wrong, I am contented with what I have now. Seeing my husband and children bursts my heart. Then here comes the movie, Inside out. Then I’ll bounce back happier and more determined. I’ve been hearing a lot of people raving about how liberating it is to follow one’s passion and jump at any chance they can get. Wrong! Have they told you the preparation and support group that have been laid out for them (with or without their knowledge) to equip them to pursue what they wanted in life? Let’s not focus on that jump because it will come out naturally, focus on laying down the path from your comfort zone to that scary cliff. Because you’d rather take it slow, than make excuses after. Search Opt Media Inc. conquered Puerto Princesa and El Nido. Looking forward to our next Team Building/Strategic Plan. First training I attended this year is ‘Adding Value Using Risk-based Auditing.’ This program is awfully familiar to me as I was already trained by SGV and this has been mentioned frequently during my CIA review. So why did I take it? My boss asked me to, so what can I do? As expected, I was bored to death as I once again encountered slides about audit standards and practice advisories (give me a break!). But thanks to most trainees who happen to be Chief Audit Executives (CAE), I just had this realization. Four years ago I applied for an analyst position at PNOC-EDC because my batch mate in college advised me that there was an opening. After I passed the exam, I vividly remember how confused I was when the CAE’s secretary called me up to schedule an interview. At that time, who would have thought that audit department needs an engineer to fill an auditor position? But as I was assigned with diverse audit engagements which required me to meet people with varying positions from different places, observe and review unfamiliar procedures, I did not realize that 3 years of rich experience has passed. Yet questioning my audit competency never left my mind because I pursued an engineering course not accountancy. That insecurity, together with the desire to go abroad, pushed me to take the CIA exam. Now I am already a Certified Internal Auditor and planning to take the CISA (Certified Information Systems Auditor) in the near future. So what is my realization then? Surprisingly (to me and I guess to those who I have worked with), I now know what I would want to end up in the future. I would want to be a Chief Audit Executive myself. Based on standards, CAE should report functionally to the Board of Directors specifically the Audit Committee and administratively to the CEO. Not bad for a position eh? Well, I’m gonna push my luck (I don’t want whammy! )… we’ll see. 1. We are still in the process of renovating our office. It’s emotionally and financially draining. I don’t know where to get more supply of patience as we wait for it to finally be over. I can’t wait to see the output and I can’t wait to settle all our dues so that we can move on to our next project. 2. I am undergoing splint therapy because of my TMJ disorder. After 6 months, I’d be wearing braces to make the treatment permanent. TMJ has been causing pain in my facial muscles, neck and shoulders for years. 3. What’s the travel plan for 2015? I HAVE NO IDEA! (Can you feel the frustration? haha!) Kidding aside, we’ve been delaying a lot of things because we wanted to focus our resources on our new office. As I’ve said, renovating a vacant 220 sqm office space is not a walk in the park. I am still hopeful we’ll continue the yearly tradition, but just in case nothing pushed through, I’m ready. 4. We’ve been pitching to local brands about our company Propelrr. We’re meeting brand managers, members of the top management, even entrepreneurs themselves to present our company and what we can provide. Definitely a learning experience for a structured engineer-turned-auditor who’s more into financial and operations rather than sales and marketing – that’s me. 5. I am reading a really good book, the Conspiracy of Fools: A True Story. It is about the Enron scandal that led to the bankruptcy of this American energy company. I knew from the very start that it’s going to be a good book, but it turned out to be MORE than I expected. I am learning a lot about running a business from a C-level perspective while enjoying a mystery novel. 6. Our kids are all big! Marcus just turned 16 (the age I met Gary, can you imagine? ), and he’ll be in 10th grade this coming school year. He’s now busy helping the company as an intern (not a requirement from his school but from me for him to earn the bass guitar that he’s been asking since last year.) Zach is turning 10, ready for 5th grade, and finally had his circumcision. Lia turned 6 last May and will be a grade schooler in a few months. Compared to last year, by this time, we’ve already been to Surigao-Japan-Palawan-Baguio. But well, we didn’t have a real office space then. Those travel put together wouldn’t match the cost of the four ceiling-aircon alone that were recently installed in our new office. So nothing to complain about, really. The reason for the new design of my old blogsite is that it was hacked. I am still in the process of redesigning and re-posting my previous posts, but at least now I can start blogging again. It has been 5 months since my last post and I cannot emphasize enough how time flies. The highlight of this quarter is our transfer to and the renovation of Propelrr’s new office. It will be finished hopefully by the end of May and it will look like this. Warehouse style ang peg, but instead of wood we’ll be using steel. Another milestone for Search Opt Media Inc.
You may ask, how long have you been doing business? Were you successful the first time? As I’ve mentioned probably for a number of times already, I never imagined myself being a full-time business owner, or at least not this soon. I envisioned myself climbing up the corporate ladder until I enjoy the perks of being part of the top management. It was my husband who cannot keep still in the corporate world and embraced a number of opportunities presented to him. It was a challenge for both us because we have different risk appetites. Those businesses failed btw. I’ve seen loopholes, my husband gained wisdom. We realized, as husband and wife, that if we wanted to be business partners, we have to meet somewhere. It took a while for us to finally accept our differences and use it as our advantage. Being a control-freak, analytic and introvert, I have to accept where my risk-taker husband is coming from. The most effective medium that influenced my sudden change of heart is by reading business books. I tell you, I matured in months. A couple of reading, but mostly experience has taught my husband on the other hand to sometimes step-back before making a big decision. He lead the company, I prepared the path. We’ve been doing business for a decade already. And no, we were not successful the first time. Transitioning from an SEO company to a Digital Marketing Company is a leap of faith. But we have no choice. I am just glad that my visionary husband led our team to that transition before it’s too late. And God is pushing us even further, He’s preparing us to transfer to a bigger office. 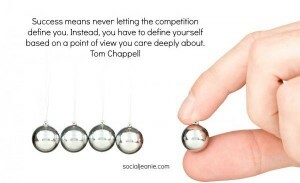 On my end, this means that I can no longer hold on to my excuse of not having enough Marketing skills and knowledge. I’ve read a couple of Marketing books though, but I don’t think that’s enough. I have to have the right training and experience to do Marketing. It took a lot of courage from me to start from scratch and embrace the idea that I have to do Marketing as well. It’s a long way for me though, I have to stretch myself even more. As they say, “It’s better not to know things sometimes” because now I am thinking about how to grow the company which used to be solely my husband’s concern. Hah! Seriously, looking at the growth-share matrix, I am seeing our company as a “Star”. (A star is a unit with high market share in a fast-growing industry. Stars require high funding to fight competitions and maintain a growth rate.) This means that we need to have a “Cash Cow” business unit that will fund this Star. 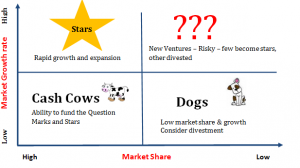 What could our cash cow be if our main business is a Star? So where am I now on my financial journey? I used to think that I’m already at my peak. From an employee trying to make ends meet, to a business owner of a Digital Marketing Company, Coffeeshop and an Independent Distributor of Royale. My family and I are definitely enjoying a lot of things we couldn’t afford before. But are we having an easy life? Hell no! If we stop what we’re doing right now, we definitely won’t last. That made me realize that I may have climbed a few steps up, I am still far from my peak. And I didn’t stop there, I fed myself more knowledge and information through reading, letting my eyes open wider. I realized, instead of focusing only on my strengths, why not work on my weaknesses as well. I cannot continue doing what I am doing now if I wanted to create big things. I have to do more, be more. This is getting more exciting. Btw, you may ask why am I sharing this journey. Well, the least thing I can do now is to share my positivity as I tell my Rugs-to-getting-there story until I finally become RICH. Who knows I might inspire someone to start their journey as well.